The MetalCloak JL Wrangler M220 Rear Differential Skid Plate (DSP) protects the vulnerable ridges on the JL M220 rear differential. 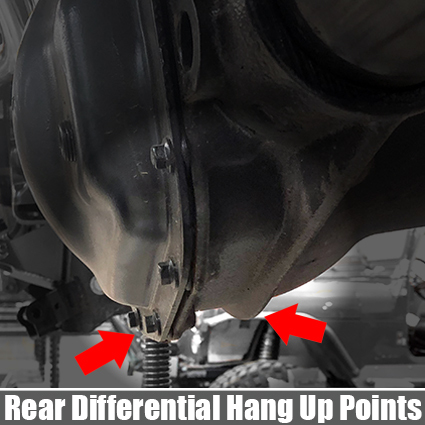 The JL Wrangler has a new rear differential design with pronounced hang up spots that can be damaged if hit while off-roading; hitting these locations can hang you up when trying to get over an obstacle and even worse break off the mounting points of your differential cover. Gold Zinc plated for additional anti-rust prevention. NOTE: This is for the M220 equipped JL Wrangler only. The M220 (aka 3rd Gen Dana 44) is found on Rubicon models and Sport Models equipped with Limited Slip. Please check your model before purchasing. This short video covers what you need to know about the Rear Axle Skid Plate for the JL Wrangler. Dragging your rear differential on the rocks when off-roading is going to happen; be prepared BEFORE you wreck your JL differential.